You know you’re no chef Ramsey when you use the smoke alarm instead of a kitchen timer. But you might be swearing like Chef Ramsay if you’re having trouble getting your smoke alarm not to go off every time you fry an egg. although If you’re just trying to figure out how to stop your smoke detector from chirping you might want to replace the battery. Everyone gets stuck with a temperamental smoke detector at some point. But hang on a second before you pull it off the ceiling, remove the battery, and bury it in the backyard. You know you’ll probably forget to replace it if you do that. Fortunately, there is a way to deal with this common problem without risking a fire by going without a smoke detector. Before you fly off the handle and murder your smoke detector, know there are things you can do to remedy this irritating problem that don’t involve a sledgehammer. Press the mute button – Most smoke detectors have a button that will give you 10 to 15 minutes before it will start going off again. 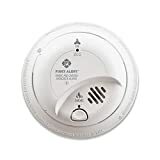 If you hate the sound of the smoke detector, you should probably locate the button before it goes off so that you have some control over the situation next time. 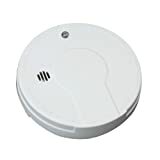 Consider replacing your smoke alarms – Older smoke alarms that have accumulated a lot of dust and dirt in and around the sensor will usually become less sensitive. But sometimes they will become more sensitive. While this is rare, you might be able to fix the problem by purchasing new smoke alarms. Also, you might consider a photoelectric smoke detector. 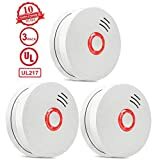 These smoke alarms detect smoke in a different way and can reduce the amount of annoying false alarms. Check if it’s an ionization type alarm – If you’re using an ionization type smoke alarm, it might be more sensitive than you need it to be. You can try to clean it by blowing air through the sensor vent. You may have to look up the model in order to do this correctly. Move the smoke detector – If your smoke detection device it too sensitive, try moving it five feet away from the kitchen or bathroom. Before you make a new nail hole in your wall, however, first tape it up with duct tape. See how it performs. Move it again if it’s still hyperactive. When you’re happy with its performance, go ahead and hang it permanently. But keep in mind, if it ends up on a tree down the road before it stops going off every time you cook- the smoke alarm might not be the problem. Remember, fire alarms save lives. So before you pull that battery out, consider some of these alternatives. As you know, a smoke alarm is there to save your life, your family’s lives, and possibly your home in the event of a fire. So, it deserves some respect- even if it’s overly sensitive. So consider that it might have a point before doing anything drastic. Humidity – Too much humidity can cause your smoke alarm to go off. This can also present a mold hazard over time. So give your smoke detector some credit and deal with the humidity problem before a dangerous mold bloom develops in your home. Fireplace smoke/soot – Your fireplace may need to be cleaned or repaired if it is causing your detector problem. Other pollutants – An excess of dust or other air pollutants may be present in your home. You should address any such problem to prevent illness or injury. To learn more about today’s newest and best smoke alarms, and find out which type may be best for your home, contact Protect America today.